I’ll be the first to admit, in high school I would lay out with baby oil on and try to get as tan as humanly possible. In college, I would hit up the tanning beds with my girlfriends. And even now, I still love to be outside (and every Sunday my left side is getting a nice bronze tan on the pit box). But with age comes wisdom (right?!) and I have changed a lot of my (bad) habits. Being an Italian girl, I never really burn. But the older I get, the more and more freckles I see on my arms, chest and even face. And that’s what really forced me to use sunblock and switch to sunless tanning. 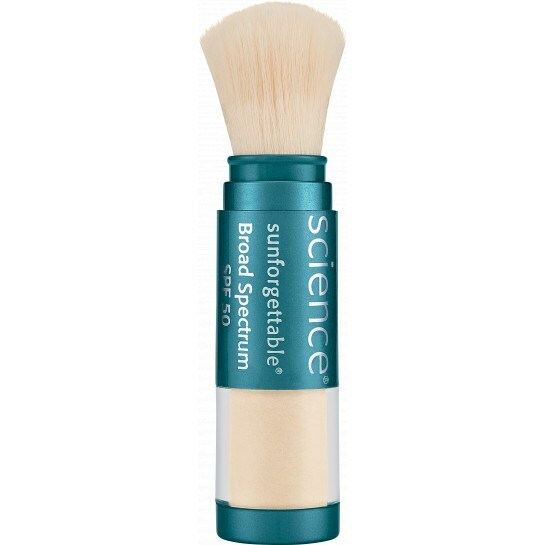 When it comes to sunblock on my face, the only one that I will use is Colorescience Sunforgettable Brush-on Sunscreen. It has SPF 50 and it is a powder form. You just apply it like you would make up. I love how it also takes away shine and is perfect to throw in your bag and reapply throughout the day. Let’s talk about sunless tanning. I will admit, I have tried a number of different lotions, mousses and sprays in the past and have had some success and some … well, not. Personally for me, the worst were the tanning towels! I always turned out so streaky and blotchy. At other times my feet looked like they belong to an Oompa Loompa. The good news is, with practice and lots of trial-and-error, I feel like I have finally found one that gives me a great tan, isn’t streaky, and surprisingly doesn’t smell horrendous (like most other sunless tanners do). 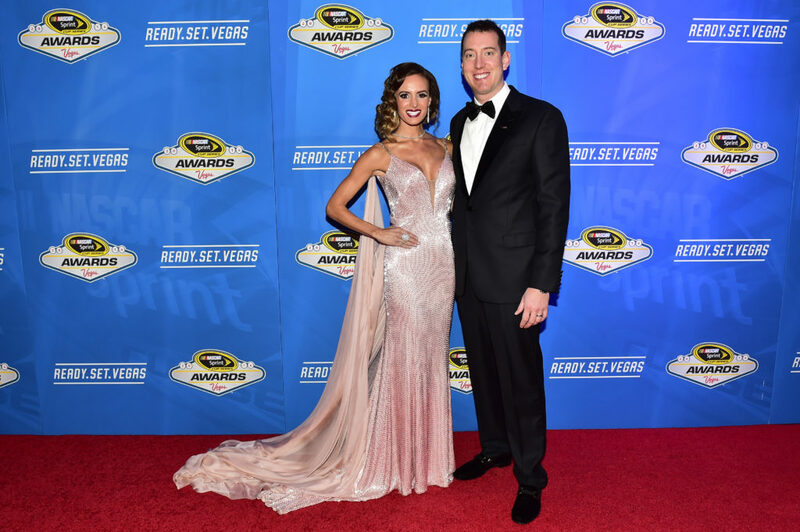 For the NASCAR banquet in December, I forgot to go out and buy my normal sunless tanner. The one I had been using was OK but it still left me a little streaky at times and it smelled so bad that Kyle always wanted me to sleep in the guest bedroom when I put it on. I didn’t have time to go to the store before we were leaving for Vegas so I had received a free sample of Mystic Tan in one of my beauty subscription boxes. Don’t ask me why before such a big event I decided to try a sunless tanner I’ve never tried before, but that’s exactly what I did. And I am so happy I did because I was so impressed with this sunless tanner. I used the Mystic Tan Mocha-Kyssed Bronzer Lotion and Spray. First of all, there was no orange undertone and though no sunless tanner smells great, this one wasn’t terrible by any means. But I really liked was how the formula was very streak free. It’s really important to prepare your skin for a self-tanner to get the best results. Below are some tips that I always do to achieve a great faux tan. First, it starts in the shower with exfoliation. Shave everything really well and then use an exfoliator to remove all your dead skin. Sometimes I even like to bring a dry brush in the shower (especially in the winter). I do not recommend using an exfoliator with any oil in it because that can lead to a streaking. To be on the safe side, after exfoliating, rewash with mild soap. Dry off and do not put any lotion on except a little bit on your elbows, feet, and side of hands. Then I apply the Mystic Tan lotion. 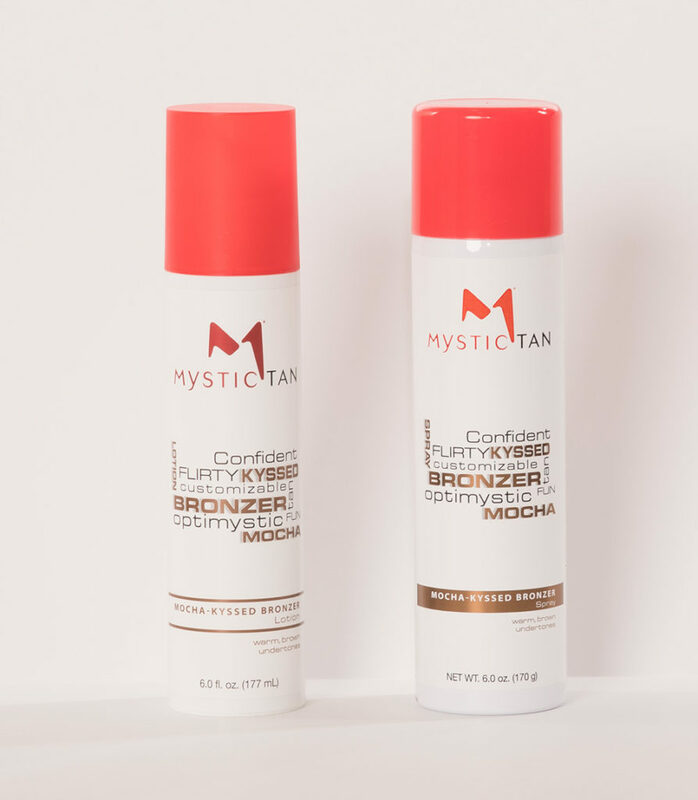 Mystic Tan offers an Applicator Mitt (that comes free with every purchase!) that assures a mess-free and streak-free application. I will admit, I’ve never tried the mitt so I can’t speak to the effectiveness. I’m just so used to using my hands that I do it that way and then wash thoroughly. Also, in the winter months when I don’t want to be super tan, I mix my tanner with regular lotion to tone the tan down a bit. Then simply let it air dry. The longer you can just hang out naked the better . I like to do all this right before bed and then put on some loose PJ’s and go to sleep. You wake up all golden bronze and then just hop in the shower. I don’t really like to use soap, I just rinse off and you have the perfect golden glow! I loved Mystic Tan so much I reached out to tell them! They were thrilled to hear it and offered me a promo code to share with you all! Usually the lotion (good-sized bottle) is $35, but with code SAMANTHA25 you can get 25% off through April! So take advantage of that awesome deal and get yourself ready for those sundresses and beach days that are just around the corner!